AquaDry Kits: On-Demand preparation of chlorine dioxide (ClO2) without the expense or maintenance of a generator! 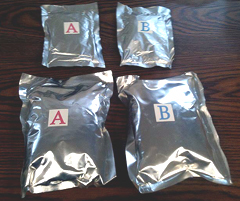 Developed especially for the quick, safe and hassle-free preparation of chlorine dioxide, our AquaDry kit products include one pouch each of reactor and activator that mix in water and are ready for use within about 10 minutes. These kits offer the versatility to produce variable liquid concentrates – or creating a vapor to “gas-off” enclosed areas – by simply adjusting the amount of water in the recommended formula. Chlorine dioxide is well-known as an effective agent for oxidizing microorganisms and reducing odor, including hydrogen sulfide (H2S). Commonly used as an alternative to chlorine, ClO2 mitigates odors at the source rather than merely masking them. Please contact us for additional technical performance information. 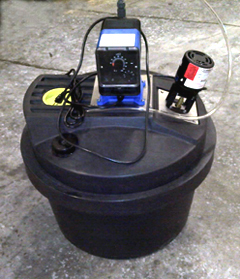 AquaDry Kits are available in a variety of sizes, including custom sizes for larger applications. Beckart offers an optional ClO2 feed unit that can be located near a clarifier, pit, gray water tank, recycled water tank, or other storage units, providing a constant source of fresh chlorine dioxide on an as-needed basis. A range of sizes are available to suit applications, required concentrations and water volumes. 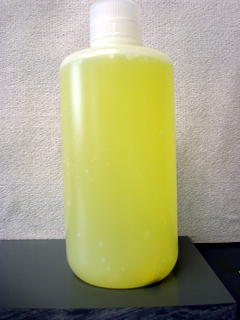 When fully activated, chlorine dioxide has a yellow color and can be used in spray bottles or pressure sprayer for safe and effective application. 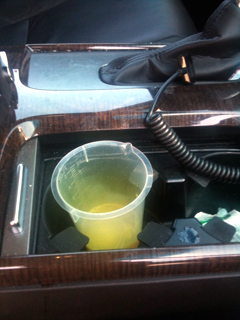 By adjusting the amount of water used in preparation, ClO2 can be used to “gas-off” odors.